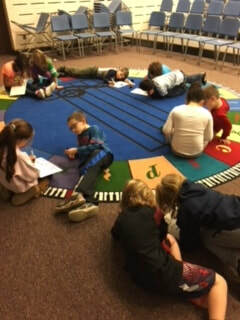 Students in fourth grade are working on an accompaniment for a song for the spring concert! 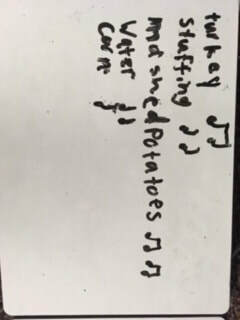 Each class is creating their own arrangement for a verse of the song and they will play and sing it in May! Check out Mr. Talbot's class working on their first arrangement! 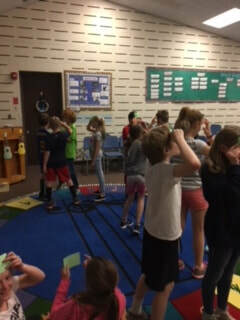 First grade students have been working on musical opposites. They listened to music to decide if it was smooth or choppy. 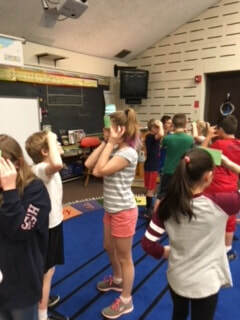 When they decided if it was smooth or choppy, they used their bodies to show what they were hearing in the music! 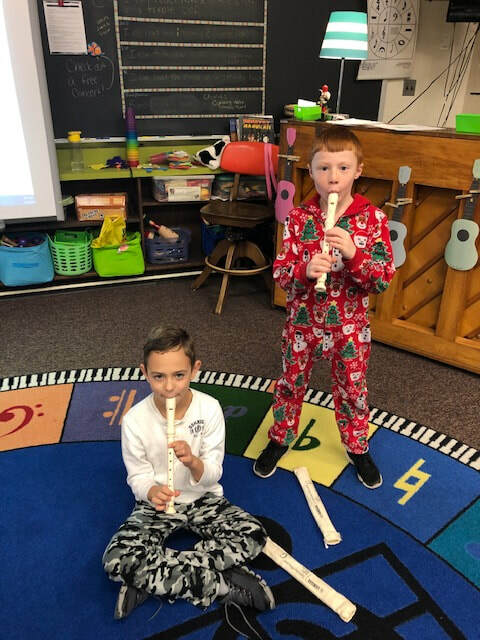 Third grade students have been working hard for a few months now to learn how to play the recorder. So far, all students have earned their white belts, 33 students have earned their yellow belts, 22 students have earned their orange belts, 12 students have earned their green belts, 7 students have earned their purple belts, 4 students have earned their blue belts, 4 students have earned their red belts, and 2 students have earned their brown belts!! 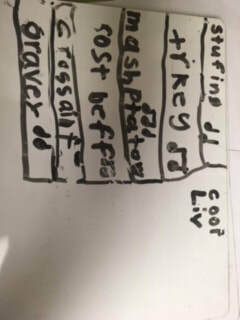 Here are some photos of our team work in class. 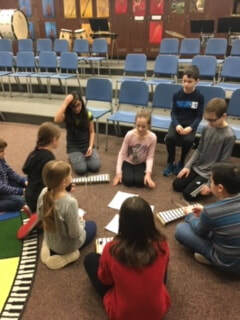 Students sometimes work on skill-building games, work with partners, or work by themselves to assist in musicianship and skill-building. 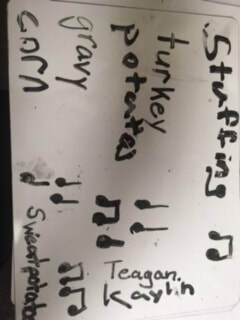 Second grade is composing for Thanksgiving! 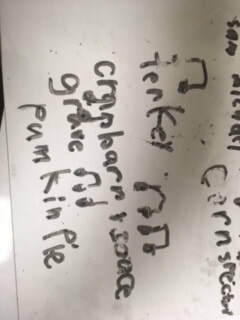 Second grade students created a list of food that they ate at Thanksgiving and using quarter and eighth notes (du and du-de) to write the rhythm for each tasty treat. Check out their rhythms! 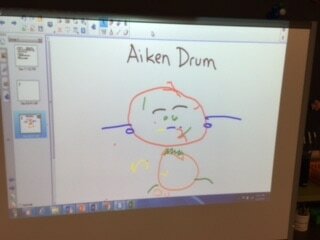 First graders keeping the beat! First grade students have learned a beat motion game called Epo I Tai Tai E. It is a Hawaiian camp song and it has a great body tapping part. 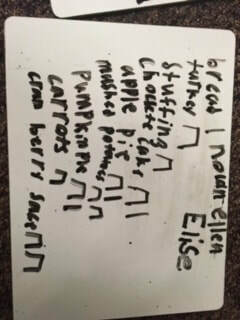 Check out these awesome skills and ask a first grader to teach you the pattern! Kindergarten Picks some musical Pumpkins! 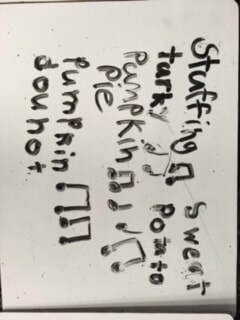 Kindergarten students have been singing some songs about pumpkins! We are working on finding their nice singing voice, and reinforcing the different types of voices; singing, speaking, whisper, and thiking voice! Check out these two pumpkin games! It's so good to see so many familiar faces and to meet some new students as well! I'm so excited for the year as we begin to learn through singing, dance, and play! If you didn't get a copy of my summer news letter, check it out below! 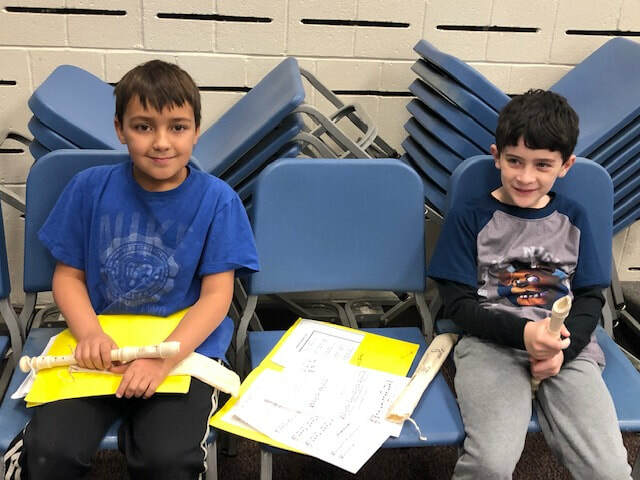 FYI the date for Band festival has been changed to May 28th at 6:30 p.m.
Students in 4th grade have been enjoying playing rhythm games including a version of the game Heads up! 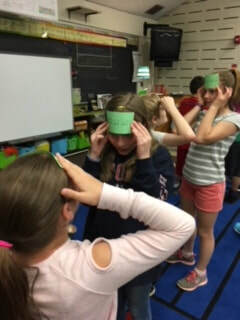 Students get a card with a rhythm pattern on it to put on their head. They can't look at their card, but they must walk around and decode the rhythm pattern they see on other students' foreheads. When they find someone who has the same rhythm as them, they sit down. 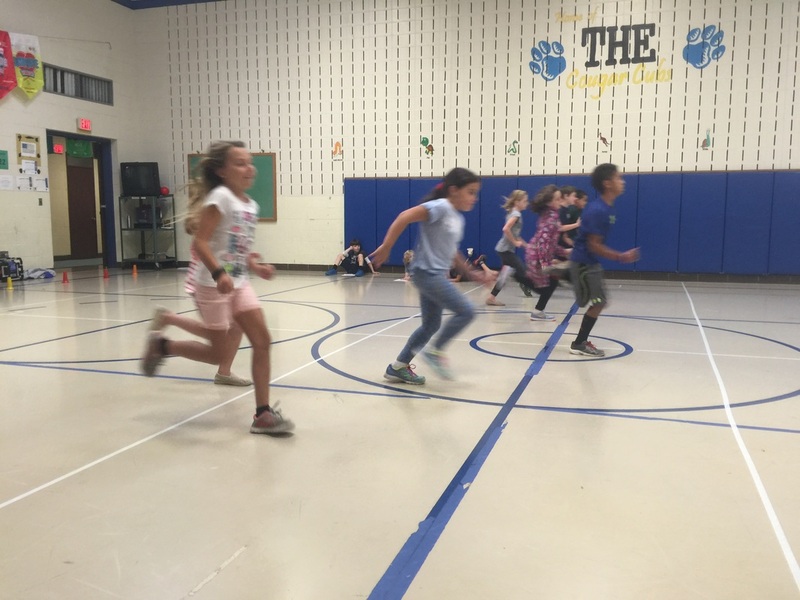 We have been racing as a class to see how fast we can all find partners! The 2nd Annual Family Folk Dance Night! 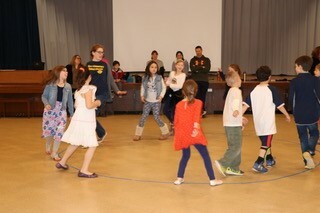 Last Friday night families of second, third and fourth grade students got together to learn and perform folk dances. We had so much fun and got out lots of built up energy from being cooped up all winter long!! 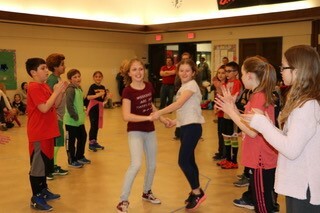 We learned dances called Irish Stew, Sashay the Donut, Heel Toe Polka, Sasha and we even got an expert demonstration of the Virginia Reel by the fourth grade students! Some guest appearance included teachers and Mr. Larson! I'm already thinking about next year's family folk dance night! I can't wait to see everyone there! 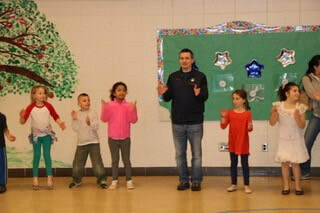 ​Fourth grade students have been learning some folk dances this year. We are especially proud to have learned two complex dances in the last few weeks. One dance called “Lucky Seven” involves a fancy move called “Grand Right and Left” in which students pass six partners alternating right and left sides and end up with the “lucky” seventh partner! The other dance they have learned is called “Sashay the Donut.” This dance involves a double circle (which looks like a donut) and during part of the dance, one pair leads the others through the “donut” shape around the circle. Second grade and musical form! 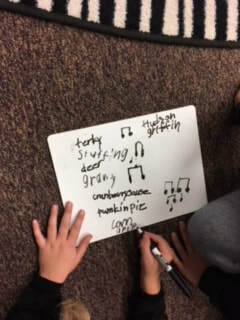 Second grade students have been composing their own rhythms using quarter and eighth notes (or as we call them, du and du-de). 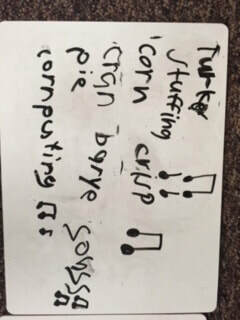 We decided to create a piece of music using ABA form. 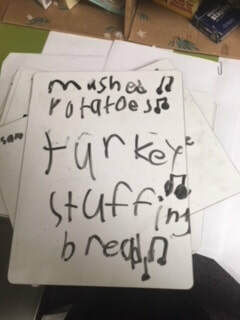 For the A section, we sang a song called Strawberry Shortcake, for the B section, the students played the rhythms they wrote on rhythms sticks four times. Then they sang the A section again! 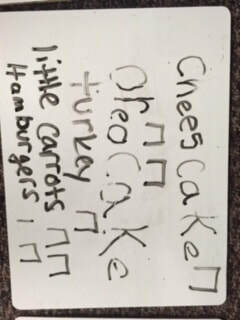 Check out our ABA pieces! 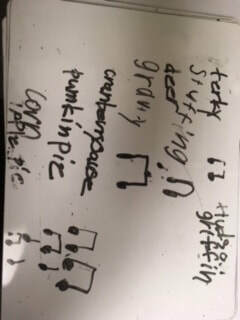 Ask a first grade student about glockenspiels! 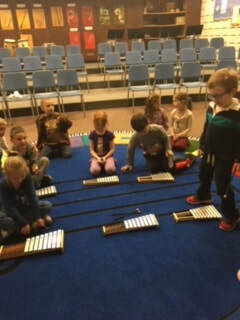 The first grade students have been learning to play glockenspiels and xylophones. These are barred instruments that are played by striking them with a mallet. Glockenspiel is the German word for "Bells." Glockenspiels are small and have metal bars. Xylophones are bigger and have wooden bars on them. 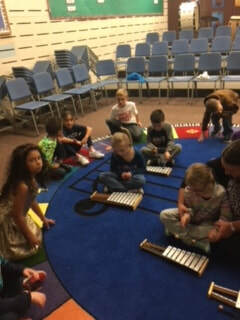 Check out some pictures and videos of our first grade students playing glockenspiels and xylophones! Kindergarten musicians hard at work! 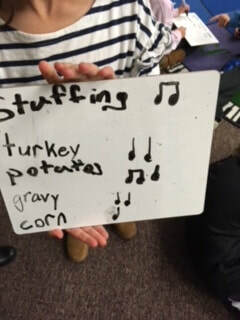 In kindergarten music, we spend a lot of time learning how to use our singing voices, how to keep a steady beat, and how to listen to the art of music! 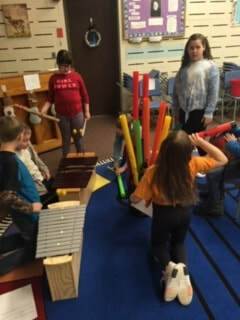 Check out our kindergarten musicians practicing their singing voices and keeping a steady beat with Peep Squirrel and Johnny Works with One Hammer! I hope you all had relaxing and fun summers! I wanted to share some fun news from my summer! I got married in June and I have changed my name, so if you get any communication from Mrs. Stern, it's me!! I'm so excited to be back making music, singing, dancing and playing instruments with my favorite musicians!! I hope to see all of you parents at open house night!! 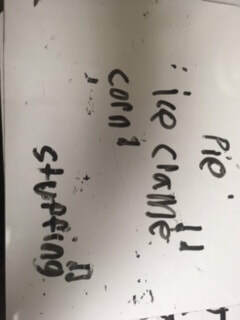 I have been very impressed with my second grade students this week. We learned a dance called Galopede and they have been dancing like professionals! Check out this short clip of one of our superbly dancing classes! 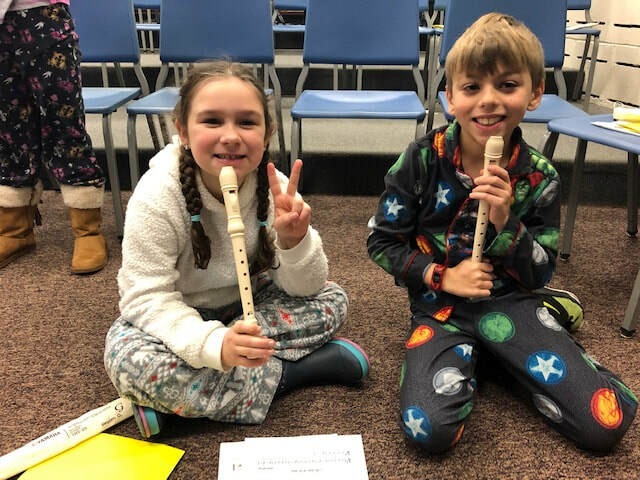 Third grade recorder concert and upcoming band event! 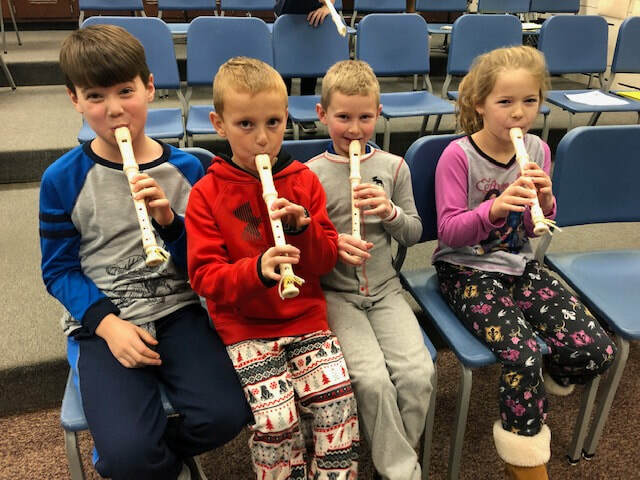 Third graders just performed a fantastic recorder concert last week. Head on over to the recorder page for my post about the concert. There will also be a third grade instrument "petting zoo" even June 13th from 6-7 pm at BES! 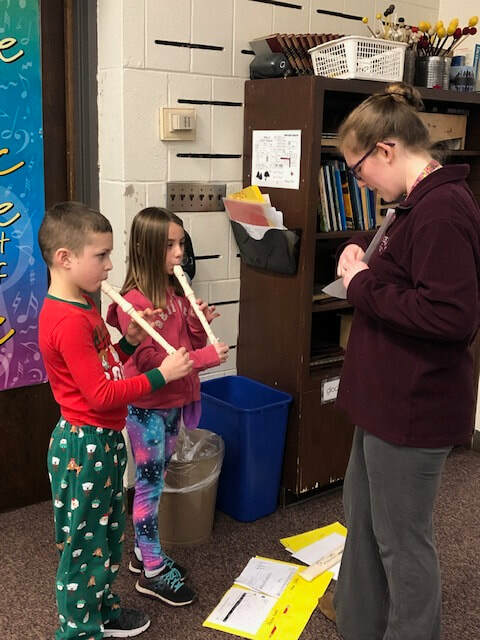 Students will get to try out instruments to see what they might like to play in band next year in fourth grade! We hope to see you there! 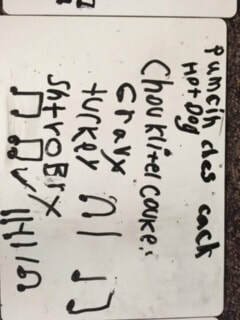 In second grade, we have been playing hand clapping and passing games. Students love to play the game Quackdidlioso! This game is set up so that all players sit in a circle with one hand under their neighbor's and the other hand over their neighbor's. As we sing the song, we take turns clapping our neighbor's hand to pass it around the circle. This activity strengthens our singing abilities and our abilities to keep a steady beat since we have to keep the song steady therefore, the passing must be steady. At the end of the song, the last student to have their hand clapped is out! 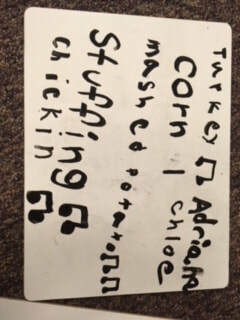 We love these games so much, one second grade student decided to make up her own song to go with a clapping game! We are also playing a new game called Obwisana Sa Nana which loosely translates to "rock is crushing my hand grandma" and is a stone passing game. Check out the videos below! And they swung, swung, swung. It was originally a finger play, but we have adapted it as a full body partner game. Check out this video and ask your kindergartener to teach it to you at home! 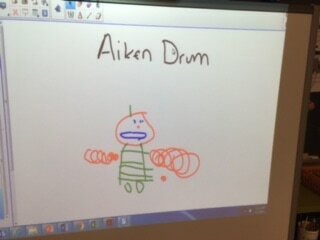 Check out our fun Aiken Drum creations!!! 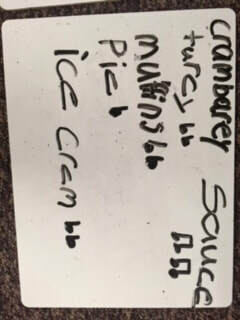 This month third graders have been trying a little improvisation! 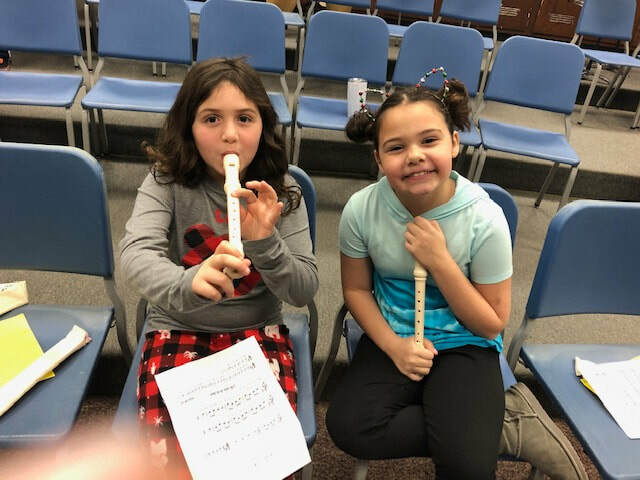 They are singing a song called Captain Go 'Side and they are making up recorder patterns on the spot using the notes GAB. Improvising is an advanced skill because it requires playing without any rehearsal. These brave students decided to try it! Enjoy! Please practice the sign language for Proud to Be an American for the Veteran's Day program next Thursday!! 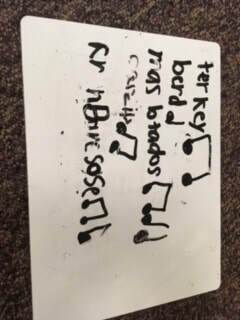 Fourth grade has been studying Mozart and his music. 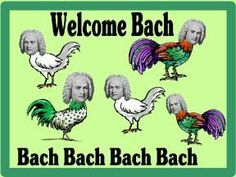 Recently we have listened to the piece called "12 Variations on Ah! Vous Dirae Je Maman" which also happens to be the tune of "Twinkle Twinkle Little Star." 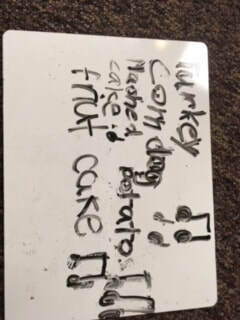 We discussed the concept of a theme and variations and also sang Twinkle Twinkle on words, letter names and solfege. 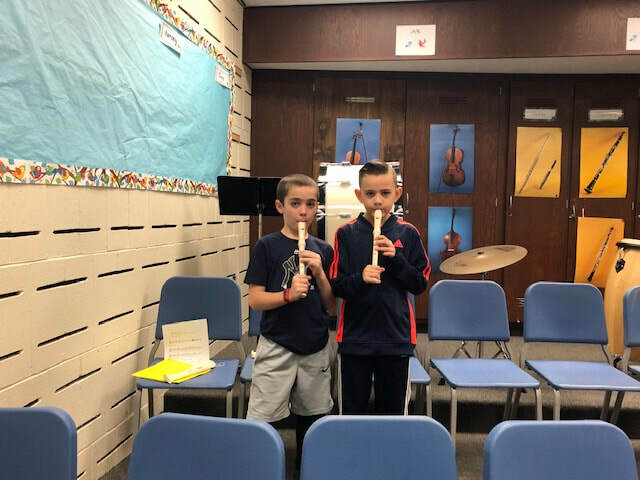 Mrs. Barse's class took this activity one step further by performing the theme on an instrument called "Boomwhackers." Boomwhackers are colored plastic tubes cut to differrent lengths to produce different pitches when tapped on the floor or on your hand. Please enjoy this performance of "Twinkle Twinkle!" Kindergarten is chanting, singing and moving away! 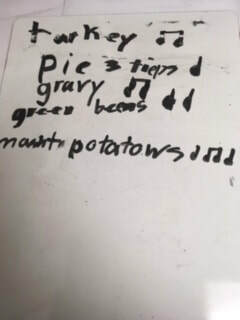 We have been learning songs, movement activities and chants in kindergarten. 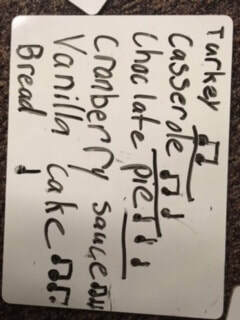 Please ask your student to chant "There Was A Little Turtle" and sing "Johnny Works With One Hammer." Enjoy these videos below! 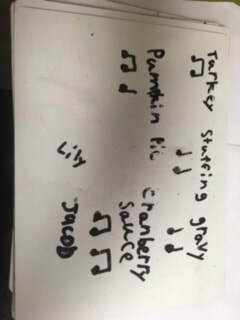 Many of the classes have been playing musical games where students are given an opportunity to "take a solo" or sing by themselves. Those brave students were sent home with a little slip of paper to proudly show their families that they "Sang a Splendid Solo in Music Class" that day! Please look for those slips and ask your child to sing the song or part of a song to you if they come home with one!! Welcome Back! I'm so happy to "sea" you! Welcome back to school! My name is Amy Polderman and I am the new music teacher at Burr Elementary school! I am so excited to be here working with the students and staff! So far, I've found that Burr is a wonderful place to be! You might even "sea" a new theme in the music room this year. If you're wondering a little about me, read on! I grew up in Connecticut but went to college at Susquehanna University in Selinsgrove, PA (Mrs. Kulmann is very excited because she also attended Susquehanna). I majored in music education with my primary instrument being the flute. I also have a minor in Spanish. I taught music for two years at a charter school in Hartford before coming to BES! I love to sing, play flute, swing dance, ring handbells, read and cook in my spare time. I can't wait to meet more families and continue to get to know you and the students!